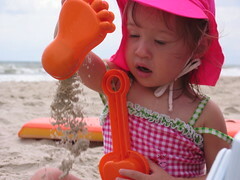 Here’s Grace enjoying the nice sand at the Outer Banks in North Carolina. 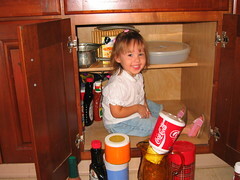 Here’s Grace cleaning out Grandma’s cupboards. 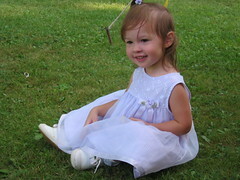 Here’s Grace at her Grandparents 50th Wedding anniversary in Kalamazoo, Michigan. 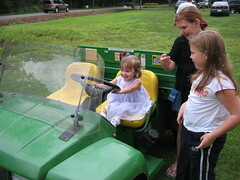 Here’s Grace coming back to the U.S. riding a John Deere. Yee hah. Call me a dork but I just thought this was a funny picture. With the Hong Kong Disneyland opening in just a few weeks, Mickey went around town and saw the sites. 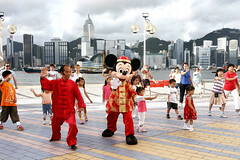 Here’s Mickey doing some Tai Chi on the Kowloon side of Hong Kong. 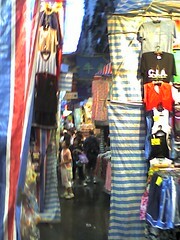 Today we went to Mong Kok to the Ladies Market to do some shopping. I took this picture because I thought it was a cool picture of all the signs. 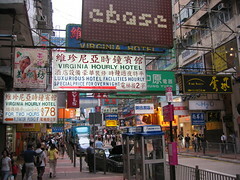 After downloading this picture and looking at it, I noticed the sign in front was for a hotel with a special for 78 HKD (10 USD) for two hours. Why would anyone rent a hotel room for two hours? Anyway, shopping was a bust because there was a big rainstorm and a Signal 1 Typhoon warning.